Amanda Ripley is back once again, and yes, once again, she has to deal with the alien horde. Yikes! Well there's only one alien this time, and Amanda will be guiding a small crew through a space station, all while avoiding the deadly creature, and uncovering the secrets of the space station's research. There are seven levels in total which start off easy, but ramp up quickly, and here you'll find all of the information you need to clear the game - all without a single spoiler. Aren't we nice? 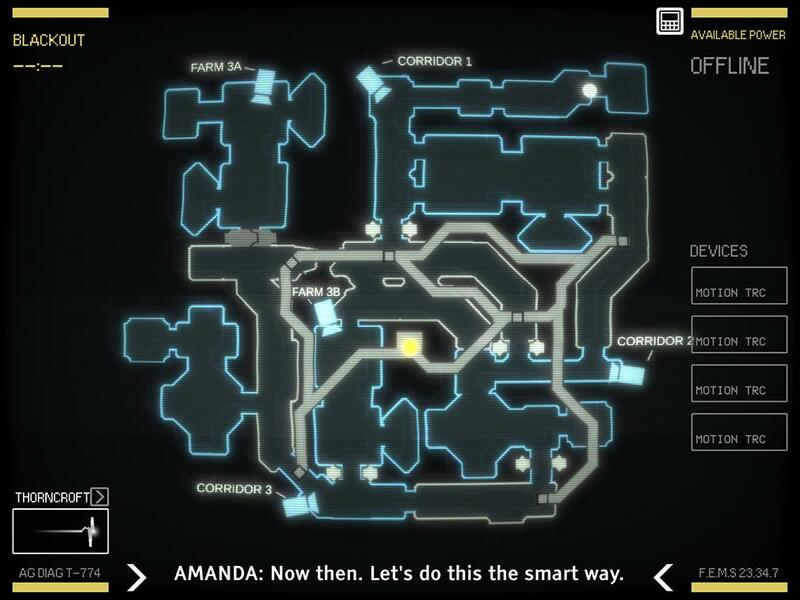 The game starts with Amanda Ripley looking through the CCTV cameras on a ship. Look at the Entrance cameras to see a scene happen. Amanda is able to close doors to protect those on the ship. For the start, you'll see the areas you can tap to interact with the environment highlighted. Tap on the doors to close them. Next you can tap the map in the bottom right to open a larger map screen. You can tap doors to open and close them. Open the doors in the top left of the map to let the people out, and tap a camera to return to the previous view. 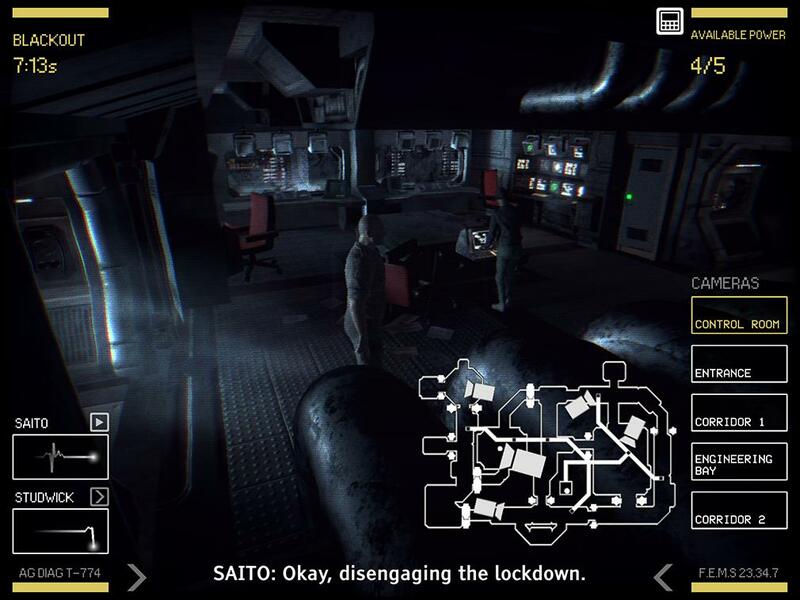 One person will enter the control room, ensure to open the doors for them, and for a bit of extra security, close the doors behind them, keeping in mind each closed door requires one of the your five power resources, so open them again when your characters are safe. Eventually both will make their way to the engineering room. After a scene, Ripley will hear some sounds. Tap on a dot on the map in the air vents - this is you. You'll be approached by an alien, and you will close the door on him, which requires power. Yeah, like Five Nights At Freddy's. This requires all of your power, leaving your crew in the ship vulnerable. Next you'll guide your two characters back to the entrance, opening and closing doors for them on the way. You'll learn you can swipe your characters in a direction from the map screen, allowing you to control their paths - though they will continue on their own without direction. With two characters, you will need to guide them to four points. You can split them up, or keep them together for safety, depending on how confident you are. Regardless, take note of doors you can close, and throw a motion tracker in the central room. 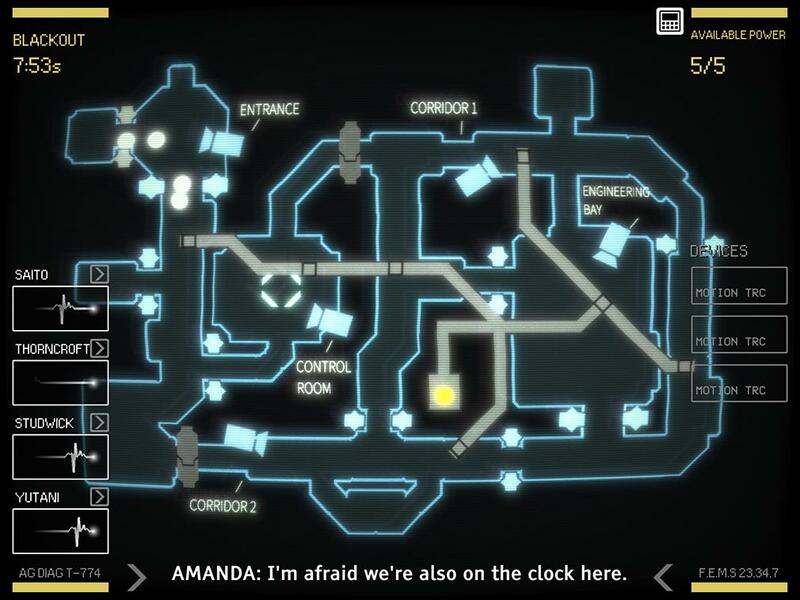 Now more than in the first level, you have to listen for rumbling noises, which will indicate the alien is coming for you, and you'll need to close the hatch to your hiding place. Headphones are recommended. 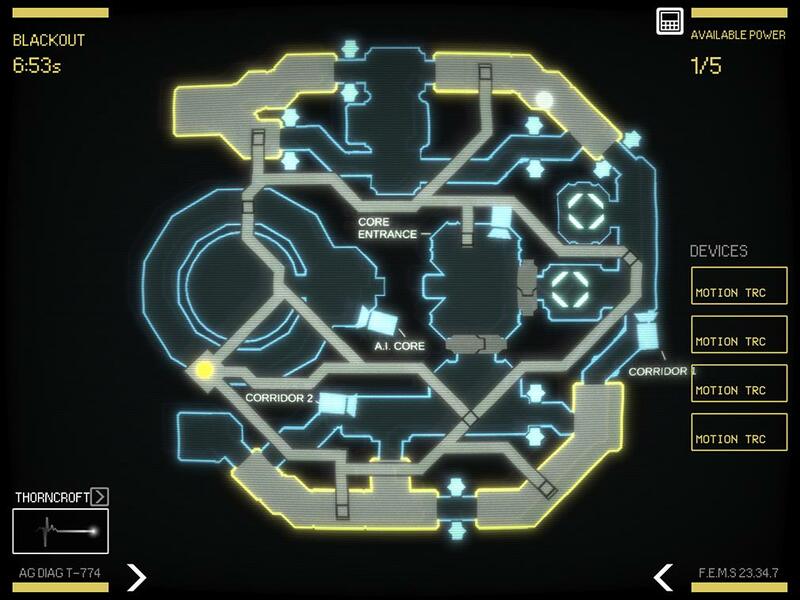 Use the cameras, motion trackers, and the information on your map to estimate where the alien is, closing doors to slow it's progress, and keeping in mind that it can use the air vents to move. You can lose one of your two characters, but not both. You can tap character names to see commands you can give them to help them evade aliens. Send Yutani to the spot marked in the top right, and send Thorncroft to the spot in the centre room. Turn on all motion trackers and close doors to ensure the alien can't make it into the centre room. Keep checking cameras. Once the information has been gathered, send Thorncroft into the spot in the bottom left. Watch for the alien, try to keep it outside. You can mess with the AI by opening and closing doors, tempting it to walk back and forth. 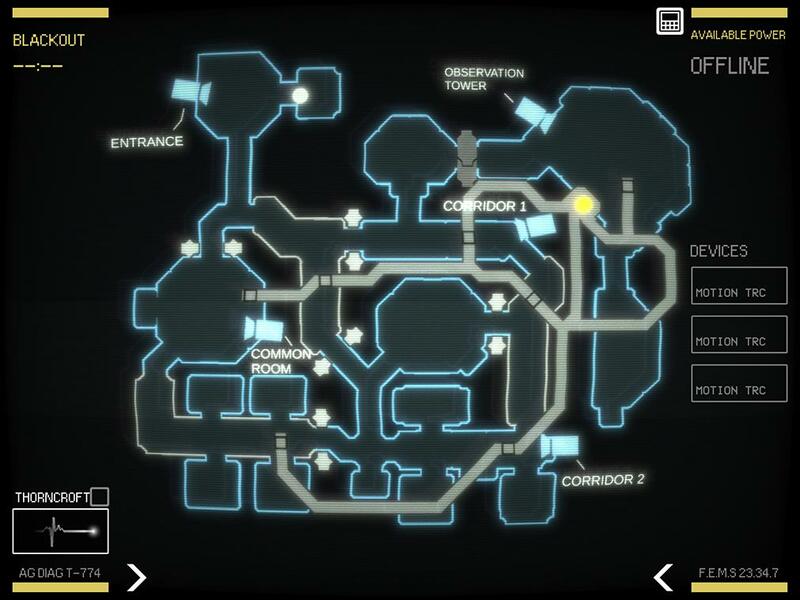 Once Thorncroft has succeeded, you need to make it to the enclosed room in the top left. Continue to use doors to confuse and keep the alien away while checking cameras to ensure it's location. Send Thorncroft the long way around the circular room, which is on the other side of the air vent, safe from aliens. In level 3 you'll be having to watch two hatches the alien can approach your hiding place from. This makes headphones even more important in detecting which hatch it will approach from. Starting without paying attention will mean death - the alien is visible in the corridor camera, exiting through into the motion tracking hall next to the station. Get the motion trackers on and move your characters either down or into the left hall behind the alien, closing the doors off behind. Then, watching the hall camera, move up towards the station. They will fix the camera, do keep an eye on it. Make sure to have motion trackers on. Move into the station, and then down again to the rooms in either corridor 1 or corridor 2. Listen for the alien approaching you through the air vents. Finally, this will open a door in the station. Get whomever survives up here as fast as possible to finish the level. Strategy for level 4 will be the same as before, throw up the motion trackers so we can identify where the alien is - the motion tracker on the right will be the least useful one, so turn off for power. First, locate the farms with your cameras. Just cycle through. Also spot the alien and keep an eye on it. While watching the alien and preparing to make your characters hide, guide them down to the small room in the bottom right. After this, you'll need to guide them to the small room on the left - take corridor 3 and make sure to watch that alien. After this you want to head up to farm 3A, and watch for that alien coming at you in the hatch. This is it's time. Once in Farm 3A, you can close the door and your characters will be safe, you just need to protect yourself. The stakes are raising, and this level comes with three - check 'em - three different hatches for the alien to approach from. Best be on your guard. Make sure to activate a couple of motion trackers immediately. First, a door is malfunctioning. 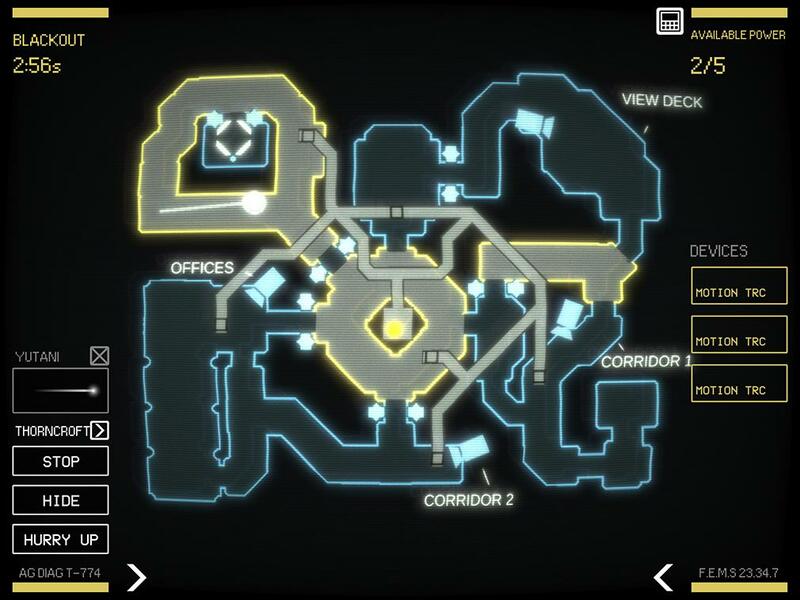 You'll need to send your characters into a small room in corridor 2 - the bottom middle of the map. This will fix the door to the observation tower. This will likely prompt the alien to either approach you, or your character. Watch the hatches. Now you'll need to approach the observation tower. Be very careful while guiding your characters through here. Make them hide if necessary. Once through, you can lock the observation tower door, then all you need to worry about are the hatches surrounding you, and the observation tower camera. Just watch and be ready to make characters hide. Another three hatches to watch this time. Remember, you can only close one hatch, so be precise. First target is directly ahead, and the alien will be found in the AI core at the left - check the cameras. Once that's done, next target is to the right of the map. Make characters hide if the alien comes close, and of course, have those motion detectors on. Close the door leading to the core entrance while you deal with it. Next target is in the room immediately above, in the same corridor. This is where the alien will likely come for you. It's often found hiding in the AI core, which is fine, as it can't do much in there until the bridge is up. Which, uh, happens now. Of course keep a watch on motion trackers and cameras, and be ready to have your characters hide and slam doors. Next you'll need to make it into the AI core. This is a pretty simple task, you'll have to worry more about your hatches. Once you're out of the AI core, you'll see the top side of the map is crawling with aliens. 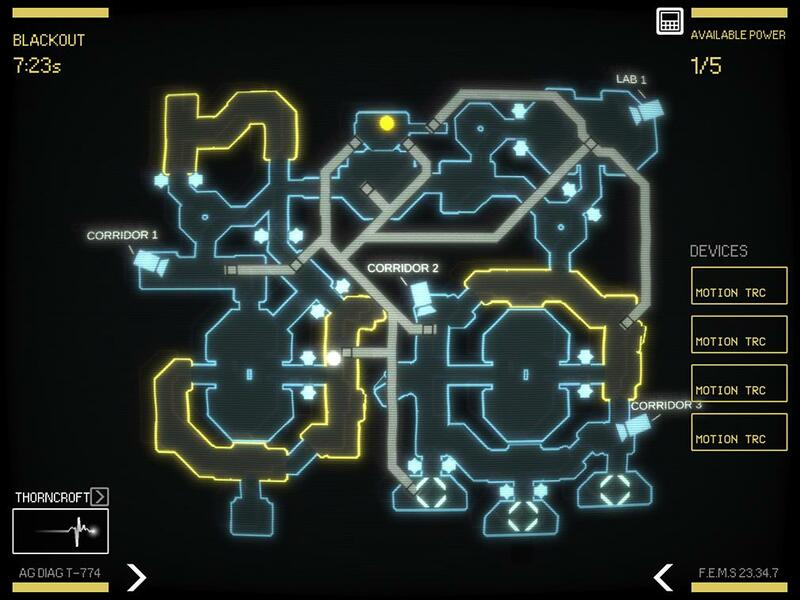 You need to escape through the bottom left, through the core entrance, and down, towards the camera in corridor 2. Close doors behind you, and you should be safe. Another three hatches to watch this time - yes, the large door to your far left is a hatch. Watch it. You'll see a large window in front of you. 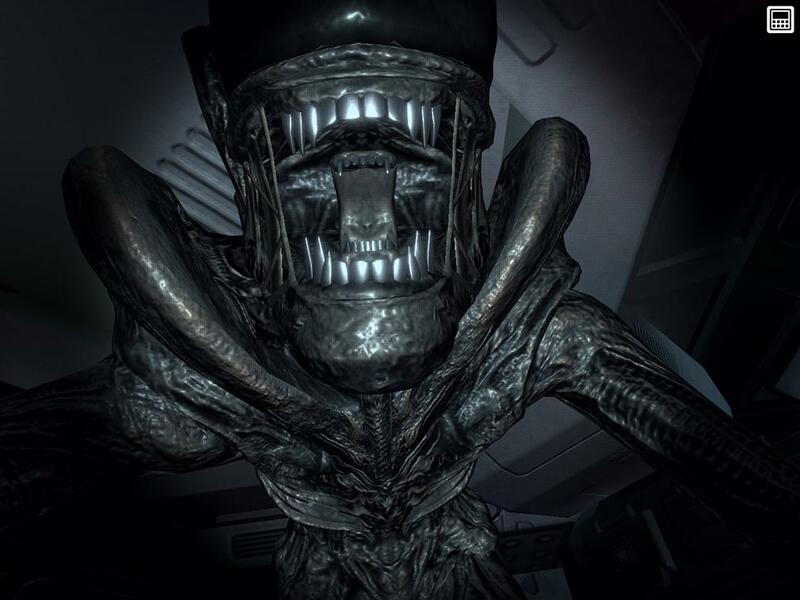 You're not in the vents anymore, and you'll be able to see characters - and the alien - walk past, giving you an extra camera almost. Four motion sensing corridors. Starting in the bottom left, you need to move your team into the lab at the top right. The alien will likely approach the team in the motion sensing corridor in the centre, which points towards corridor 2 and the path to the lab. Be ready to close doors and make them hide. 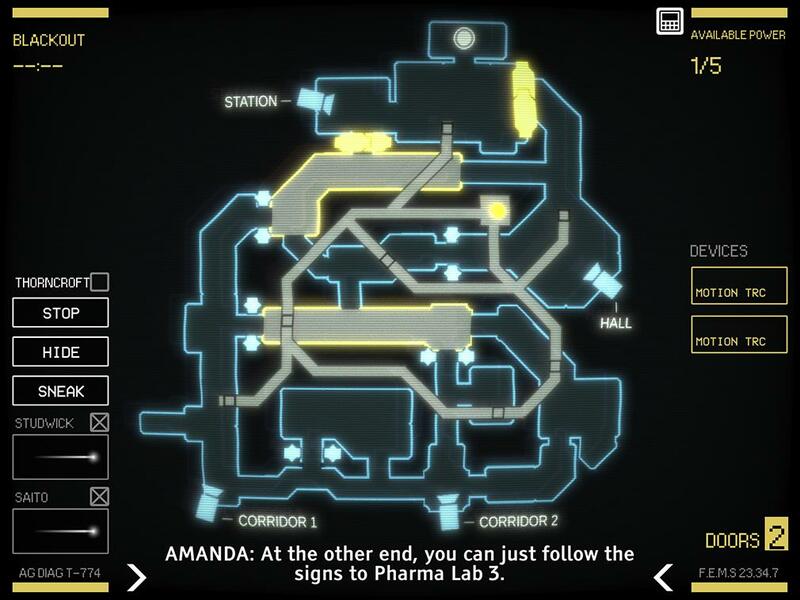 After that, you must move down to terminals in the three rooms in corridor 3. Watch for the alien, and get ready to hide. While the terminal is in use, be prepared for a hatch encounter. Next up is a terminal in the corridor leading out of the bottom of the lab. Make sure to check the lab camera for the alien. After is the terminal to the left of the lab. For this, close the lab door next to you, and keep an eye on the lab camera, and Ripley's window, to watch for the alien. Finally, after this, you'll have to make it back down to the bottom centre room in corridor 3. This is the finale, and the alien will be ravenous. Sneak more than rush, and be careful. Watch the corridor cameras and the lab cam to see where it emerges, and get ready to hide your crew. Finally, you'll see Ripley herself rush to the room, and blast off from the doomed space station. Great job, you did it! 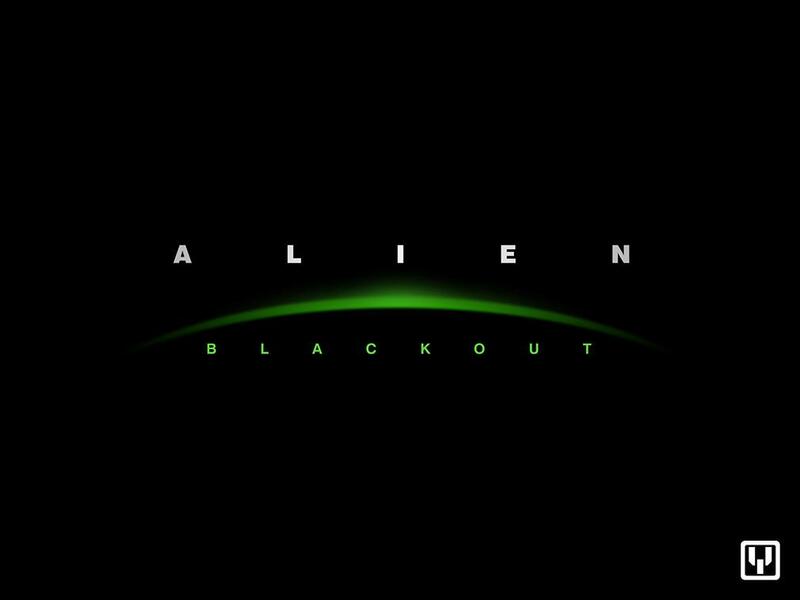 Alien: Blackout review - "Short, stealthy, sleepy"
Alien: Blackout video review - "Five Nights at Ripley's"